'I'm currently in the Basilica [of the National Shrine of the Immaculate Conception] for Mass, with about 25,000 others. The air is electric and the pope, just in his presence alone, energizes the crowd [in a way] that would make a rock star jealous. Bishop Edward B. Scharfenberger is excited about attending his first canonization ceremony today: that of Blessed Junipero Serra, an 18th-century Franciscan missionary. As the Bishop spoke with The Evangelist, he was heading into the Basilica of the National Shrine of the Immaculate Conception in Washington, D.C., to take his seat for the 4:15 p.m. Mass. He said he was looking at an enormous poster of the soon-to-be saint outside. Earlier, the Bishop said, he'd been just two seats from the end of a pew when Pope Francis passed by, processing into a prayer service at St. Matthew's Cathedral with the U.S. bishops. Bishop Scharfenberger said he was inspired by the pope's words: "He really covered a lot of bases," from the pain of the clergy sexual abuse crisis to the global refugee crisis, abortion and worldwide hunger. At the White House this morning, Pope Francis also pointed to the need for action on climate change. In his words to America's bishops, "he was very direct," Bishop Scharfenberger remarked. "He basically told the bishops to be close to the people, don't get involved in controversies -- to be a source of unity. He stressed healing." The Bishop was especially struck by the pope's admonition that "harsh and divisive language does not befit the tongue of a pastor; it has no place in his heart." Rev. Kenneth Doyle, pastor of Mater Christi parish in Albany and recently-retired chancellor for public information, was already inside the cathedral as the Bishop arrived. Father Doyle has been escorting journalists covering the pope to their destinations, working on behalf of the U.S. Conference of Catholic Bishops. Father Doyle told The Evangelist that he's sitting with Vatican journalists, some from Fox News and some print journalists, all of whom are working on stories in the hours before the Mass begins. The priest said he's already deeply impressed by "the lovely devotion" to the pope "on the part of all people, not just Catholics." 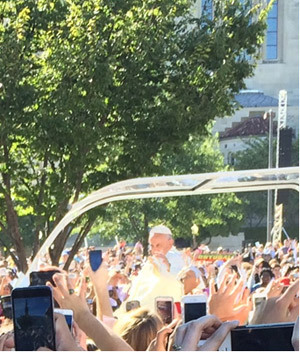 He said a man in the crowd had called out, "Pope Francis, we love you," during the pope's words at the White House - "quite a departure from the normal protocol" for a papal speech. Rev. 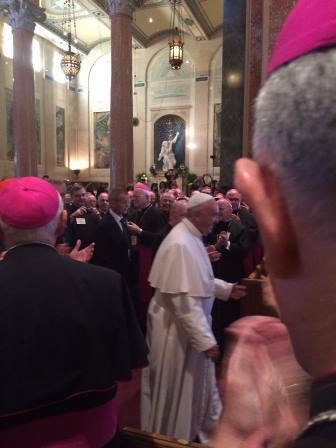 Donald Rutherford, moderator of the curia for the Albany Diocese and the former U.S. Army chief of chaplains, was present at the White House welcoming ceremony as well, but only saw the pope on a Jumbotron screen and from a great distance. "I didn't get very close," Father Rutherford told The Evangelist. "I saw him go by in the little Fiat." Still, he said, he felt like "a part of history. "What [the pope] said was very good. There were 15,000 people and everybody was happy. I stood next to a man who was born in Iraq, and we talked. He works with Iraqi refugees now." Father Rutherford, who'll head back to the Albany Diocese tonight, summed up Pope Francis' presence simply: "Even though he was far away, he brought people together."